Meet the Regional Parent Engagement Advisory Groups! This week, we are highlighting the work of the Be Strong Families Regional Parent Engagement Advisory Groups (RPEAs). RPEAs are made up of parents who are ready to be the architects of change in the lives of children and families who have been trained in Parent Cafés and are committed to building Protective Factors. They model the Be Strong Families vision of parent leadership. The parent leaders share their own story of Parent Cafés and the power of meaningful parent engagement, and have the opportunity to weigh in on a national agenda and local work through delivering Parent Cafés, piloting and giving feedback around new trainings and Cafés and bringing parent issues and concerns to the table. 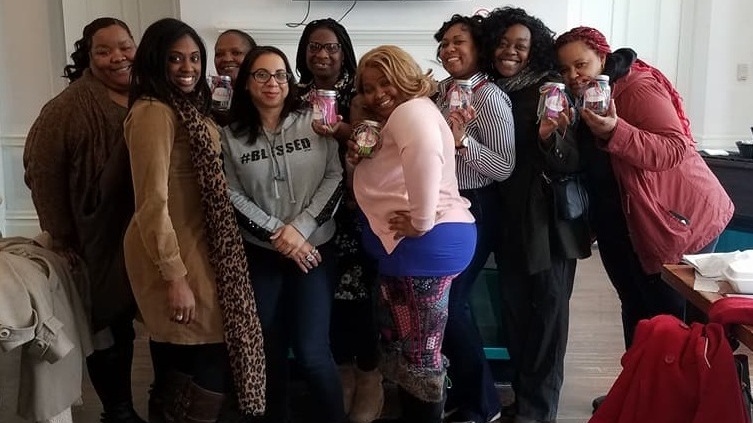 There are RPEAs currently in Philadelphia, Chicago, and Los Angeles, with groups to come soon in Oakland, Peoria, Pasadena-Altadena, and Washington, D.C.
Joy, accomplishment, and vitality by changing lives as a parent leader. Participation in monthly meetings with the group. Personal support through leadership training and speakers training. Use of our network and resources to support other parents to build protective factors, vitality and BSF values. Get to know Philly PLAN (Parent Leader Action Network), Consejo de Padres en Acción (Los Angeles), and the Cook RPEA (Chicago) below! Our goal this year is to empower our communities, our schools, our families and of course ourselves to Be Strong to grow and engage all to keep together. We will do this by having more community events and Cafés to inspire others and help people with improving outcomes for families in our community. We also want to be more involved with the youth, kids 8-15 years. 1. What Protective Factor do you most identify with and why? Social Connections – A good friend is someone who keeps me grounded and is loyal. Someone I can count on. I realized I wasn’t the only parent through Parent Cafes. They helped me connect with other parents going through similar things. 2. I have a knack for…? I have the ability to talk with everyone and feel comfortable sharing my opinions, concerns, strengths. 3. A great free resource I recently shared was…? 4. If I had to, my family and I could live without...? There are many things I can do without, because me and my family adapt to whatever the circumstances are. All we need is each other. Resilience is what I most identify with because so much has happened and I really don’t think about giving up. I must keep up together and work it out. Singing, dancing, crocheting, helping and wanting everything to go well for all. If I have the opportunity, I want all to have what I have. I recently shared with my community/school about the parent café experience and how we could work together for our families. Cable and social media—because they get in the way. There is money and stress of growing up with my children they just are needed. Social Connections. A good friend is someone who has your back, someone you can tell anything to. Someone I can call at any time. I value my friends who are able to stick it out through the bad times. Letting people know what jobs are hiring. Resilience and Concrete Supports. Though I work full time, I’m able to be present with my family and ensure they have quality time with me too. I am good at knowing what resources are around me and how to connect people to them. Sharing resources and engaging with others. The website uwishunu.com about free and low-cost activities. Loads of money because we budget very well and use a lot of coupons. Concrete Support - A lot of the people I know don’t have support and resources. I’ve been working with parents at the school to resources and get them connected. Crafting – taking things and making something new from it. The Food Bank: Pacific Food Bank. They are open to everyone and don’t question about people’s circumstances. Eating out, because I use the money in other areas and for other purposes. Our goal for this year is to continue supporting Parent Cafés in our area to promote the Protective Factors and strengthening ourselves at the same time that we transform communities. We are committed to promote Parent Cafes in our schools and our community to keep impacting other parents. We want to bring more parents to our team and invite them to our Cafe Host and Table Host training. We are willing to take all trainings offered by Be Strong Families and learn more about better ways to become better person, parents and leaders in our community. Miro los logros de mis hijos y veo que vale la pena la inversión en ellos. Nada cambiaria en la forma de criar a mis hijos porque lo que he hecho es lo que me ha ayudado a ser quien soy. A mi misma para ser mejor ser humano, amiga, madre, hija y si tengo el poder de cambiarme a mi misma puedo cambiar un pedacito del mundo. Podría lograr lo que logrado y hacer las cosas que he hecho en mi vida. Mi responsabilidad y fortaleza que me han ayudado a ser mejor madre al llevar un parámetro de familia como madre soltera. La fortaleza me ha ayudado a seguir viviendo mi responsabilidad como madre. Mis hijos nacieron porque me ayudaron a conocer el verdadero amor a mi misma, a ellos y a la sociedad. Mucho mejor porque usaría mi enseñanza previa y la tomaría como oportunidad para aprender más en la vida. Todo lo referente a mis actos, mis errores para no cometerlos otra vez. Tengo el poder de enseñar valores a mis hijos, pero sobre todo tengo el poder de cambiarme a mi misma y las cosas que hay en mi entorno familiar. Iba a vivir tan rápido, que la vida iba a ser tan difícil y tan hermosa porque he logrado lo que he deseado, casarme tener hijos y ser la gran persona que soy para mis hijos y para los demás. Enfrentarme a un idioma diferente todos los días. Tomamos el tiempo para estar juntos como familia. La misma persona porque he hecho lo mejor de mi para proteger y proveer lo mejor a mis hijos. Mi carácter, exigir menos, ser mas fuerte y a la vez flexible. Iba a sentir tanto amor por mis hijos. Amor, darle amor a mis hijos. Es la persona que es leal. Cuando mi hija me llamo “mala” y tuve la oportunidad de aprender en un taller que el ser padre es un placer y no soy la única con estos problemas. La muestra de lealtad y amor incondicional cuando están conmigo en todo momento sin importar la distancia. Es escuchar atentamente para comprendernos mutuamente y saber por lo que está pasando. Afirmarme que YO puedo y que cada cosa que yo decida hacer con principios y valores valen la pena. Siempre esta contigo en las buenas y en las malas. Sino que también podría ser una amiga para mi hija. ¡Sus consejos porque valen mucho y son gratis! Siempre se va a manifestar confianza. Comunicarme, hablar y escuchar a mis hijos. Darles a ellos la oportunidad de poder expresarse. La forma de amar de mis padres y sobre todo la dedicación de mi padre al apoyar a mi madre durante su enfermedad y luchar por la familia. La dedicación de más tiempo con mis hijos sin asumir lo que quieren sino preguntar y entender lo que ellos quieren y necesitan. Manejar mis planes y tener un presupuesto y una agenda que me permita manejar mi dinero y alcanzar mis metas. Cuando tuve que dejar mi trabajo que realmente me gustaba por otro trabajo que me permitió darme cuenta que yo podía vencer muchos obstáculos. Televisión porque siento que es un distractor y no necesaria. Cafés para Padres y el programa de Best Start. ¿Porque eres tan callada? Le animaría a expresarse y a no tener miedo de no ser escuchada. Expresándoselos y animándolos para que me tengan confianza. Quiero que mis hijos vean la importancia de la educación, por eso voy a la escuela para mostrarles que si se puede lograr. Organizar mi hogar y comunicación con mis hijos haciéndoles saber que no tengan miedo porque en casa estoy yo para cuidarlos y protegerlos. Podemos pasar un buen rato comiendo juntos, jugando juegos de mesa, y hablar de cosas que nos pasan. ¡Me encanta este tiempo! Our goal for this year is to hold Cafés in the community to reintroduce Cafés to and to help recruit parents and rebuild our Regional Parent Engagement Advisory group in Chicago. Strong communication; I’ve always kept a strong communication with my children. My oldest son came home from spring break (college) and thanked me for making him study hard instead of allowing him to play and goof off. That let me know that I gave him some of my best parenting. To spend more time with my kids doing the things that mattered. You use everything you’ve been through- even the bad stuff, as a foundation; the bad stuff is necessary if you use it to your advantage to help yourself, your family and others. My family (kids) would be where they are in life: independent and confident! Is to watch how I talk to my children. In other words, to use gentle, not harsh communication with my children and to take the time to explain things to them. Also, try to treat the boys and girls the same; don’t perpetuate gender stereotypes. Allow my children to express feelings and to hold them equally accountable and have the same expectations of them regardless of their gender. This advice came from my dad who I wasn’t close to growing up, but I respected his wisdom. Someone who can see my short comings and still love me in spite of them. My adoptive mom was my very best friend. That my circle is small, selective and people I choose to have in my space. They’ve been chosen for a purpose. If something were to happen to me, my kids would be ok because they have a family that is purposefully chosen. Family- grandparents, brothers, sisters, aunts and uncles. And that’s not necessarily people that I shared DNA with, but more people who I have created a strong relationship with and who care about me and my children. I learned to build my own family, my own community. My children were returned home. To avoid using physical discipline. Find the humor in my mistakes by trying to make it fun somehow. My situation, my experience would be able to help another parent regain overnights and close to getting custody of their children like myself. Getting to bottom of whatever the situation is; finding out the why. Believe and trust their instincts. I enlisted the help of those closest to me. I called certain people to give me a reality check. If there was an adult that crossed the line, I always knew my parents would handle it. I wasn’t on my own. I didn’t have to assume the role of an adult. I’ve learned to listen more and talk less. Wanting to be there for others when they are in need. I seem to give more than I receive when it comes to support; I’m more available for others than others are available for me. That it’s very important. Tomorrow is not promised! We need to save for unexpected situations. I’m trying to model this belief and I need to do better in this area. The loss of my job eight years ago. When doors are closed by man, it leads you to what God has purposed for you in life. Sometimes when you lose, you win. When I lost my job, I discovered that I needed to improve my parenting; my first job is parenting. Losing my job allowed me more time to focus on fostering the child that I was currently caring for. It allowed me time to take better care of myself and that child. Foster care agencies encourage you to work outside of fostering, but I was allowed to foster two additional children in spite of not having a job and that experience gave me a new perspective about what really matters. Different forms of media. Media has a lot of negative influences. I would love to replace media with reading; reading enhances knowledge. I would like to get back to going to the library. I also think it’s important to enjoy being outdoors like we did when we were kids. Be Strong Families- in particular the Parent Cafés! Cafes allow you to get to meet other parents, and share and pull from each other. We walk away with knowledge and the support of other parents. If you are part of a parent-led Parent Café effort and want to learn more about how to become a Be Strong Families Regional Parent Engagement Advisory Group, contact Sarita Sashington, Café Community of Practice Team Lead, at sarita@bestrongfamilies.net.